I just regripped my clubs from standard to oversized about ten days ago based on my common problem of every time I get a good strike it draws most of the time. I know guys like that but I dont because its too unpredictable for me. 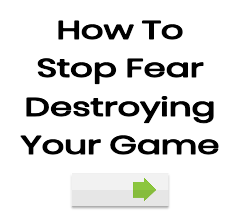 I read that oversized grips will make the ball fly straight or to the right. Now most of my good strikes go dead straight or have a baby fade that is extremely playable. ALL of my ‘bad’ shots are ONLY strong fades now. Its almost like the whole left side of the fairway is gone now and I dont have to worry about it anymore where I used to be playing army golf (left, right, left, right). I was getting bogeys so easily yesterday on so many holes that I couldnt believe it (Been playing about 18 months total so far). My lowest scores have been 91, but I have to REALLY work to get those before. With this grip change as long as my putting doesnt go down the tubes getting that score should be a LOT easier now since Im hitting more fairways more often. I suggest to ALL new players that before you spend thousands in lessons and do what I did and go thru 10 sets of irons looking for the ones that actually live up to the claims of making you play like a pro, that you take one of your long irons or hybrids and have it regripped with an oversized grip. Just do the one so you can see if there is an instant change or not. 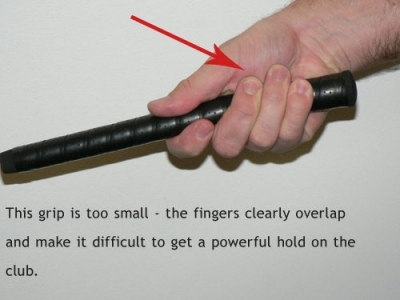 At first you’ll be going right a bit but once you get your address and grip adjusted you should be hitting straight balls with some small fades and practically ZERO balls left. Its almost like you remove the whole left side of the fairway, which means you have a much higher percentage to keep the ball in play. 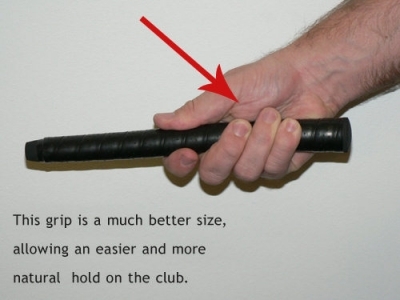 Yep, thicker grips are good. Everyone should give ’em a go.